In order to deposit a check by phone or a check by fax you must use Approved Check Security Paper. We use only the best quality 24 lb stock blue marble check security paper. You can also purchase check paper from your local Staples or Office Max - just look for Quicken or Quick Books compatible blank check stock for business checks. One brand is Versa check form 1000 for 1 check (on top) and two receipts or form 3000 for 3 checks to a page. The checks we use are 3 to a page and each check is 3 1/2" by 8 1/2" and there is a 1/2" strip at the bottom - you should look for the same size if buying your own checks. All checks are 3 to a page business size. All checks are shipped in 1-3 business days. All check prices include UPS ground delivery. Purchase Terms - We are in no way liable for incorrect shipments other than to replace the incorrect or missing product via normal UPS ground shipment. Deposit Slips - you can now print deposit slips with Q~Check. 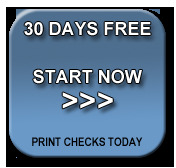 At the end of the day just drop in a deposit slip form and print out all the day's check deposits on the deposit slip. You can even add cash to the deposit.